Electrick is a seemingly easy way to add touch input to any object. Nowadays we're accustomed to the slick glass touchscreens on our phones and tablets, but what if we could extend such luxury to other parts of our devices -- or to any surface, for that matter -- in a cheap and cheerful way? Well, apparently there's a solution on the way. At the ACM CHI conference this week, Carnegie Mellon University's Future Interfaces Group showed off its latest research project, dubbed Electrick, which enables low-cost touch sensing on pretty much any object with a conductive surface -- either it's made out of a conductive material (including plastics mixed with conductive particles) or has a conductive coating (such as a carbon conductive spray paint) applied over it. Better yet, this technique works on irregular surfaces as well. The sensing principle behind this is based on electric field tomography. Basically, the surface is surrounded by a number of electrodes (say, 8 to 16 of them, depending on the surface size), with one adjacent pair of electrodes injecting a small current to the surface, and the voltage at other pairs are measured. This cycle is repeated by rotating the pair of current-emitting electrodes. When a finger is placed on the surface, some current is shunted and thus reducing the localized voltages during each cycle, and by combining these cross-sectional measurements from all cycles, the finger's 2D position can then be located. Electrick also supports multi-touch, though given the lower sensing resolution, it's understandably not as robust as conventional touchscreens when the fingers are too close to each other. Given how easy it is to apply Electrick onto any object and surface, this opens up all sorts of opportunities to both modders and manufacturers, and Future Interfaces Group showed off many cool ideas here. One of my favorites is the electric guitar demo: it's sprayed with carbon conductive paint with electrodes attached along the edges, and after dragging the custom controls -- a tremolo arm and a filter button, in this case -- into the desired places using the companion app, the player can immediately use those features by touching the corresponding spots on the actual guitar. Similar functionalities can be applied to Play-doh, Jell-O and 3D-printed objects made out of conductive filaments. Another interesting use case involved vacuum-forming Velostat (a carbon-loaded polyolefin film by 3M) onto the back cover of a smartphone, and with the electrodes attached, this enables the phone to detect different grips and thus toggle the corresponding apps. For instance, holding the phone horizontally by the ends of its top and bottom edges would trigger the camera app, and holding the phone vertically with both thumbs ready to type would trigger the keyboard. Even car owners may benefit from this technology. In another demo, Future Interfaces Group sprayed carbon paint onto an ordinary steering wheel, and then attached electrodes to its outer edge. 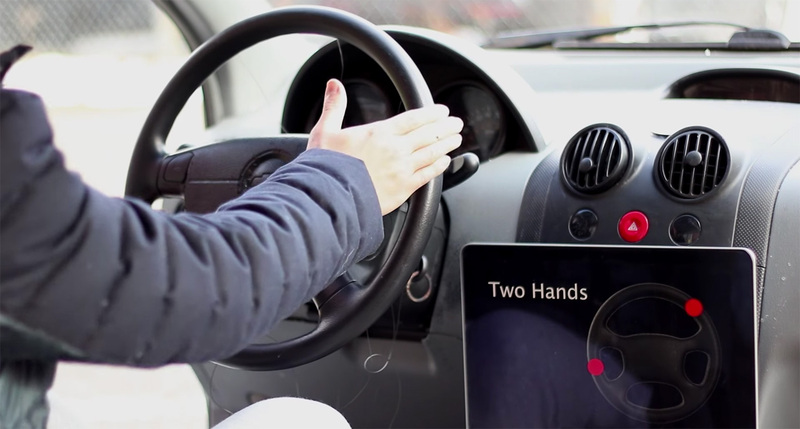 This effectively turned the steering wheel into a giant gesture input device for potential dashboard applications, and it could also serve as a hand detection feature to ensure safe driving. Electrick isn't limited to small objects; it can also work on large surfaces like desks and even walls. One demo added gesture input functionality to anywhere on a wall for controlling a light fixture: tap to turn it on or off, and drag up or down to adjust its brightness. And in case you're wondering, the conductive carbon paint works under the protective latex wall paint. As for the desk demo, you can assign specific touch-sensitive spots for launching apps or toggling functions on your computer. As simple as the technology behind Electrick sounds, it'll still be at least a year away from commercialization, according to Future Interfaces Group director Chris Harrison (who also happens to be the co-founder and CTO of Qeexo, a UX startup spun out of Carnegie Mellon). That said, once the performance and noise filtering have been optimized, it'll simply be a matter of packaging up the circuitry as a single chip or even applying it in software form.